Gobble Gobble Gobble.. Pilgrim Turkey Card.. Plus Freebie SVG File and Digi Stamp! Gobble Gobble Gobble… That’s me saying Hi! Today I have this super cute turkey card to share with you. 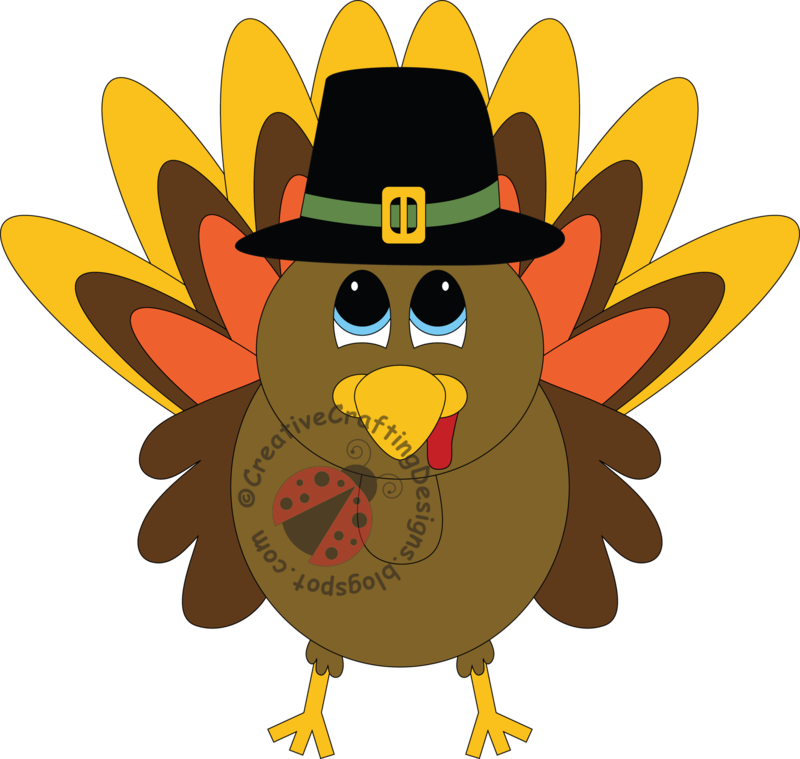 Guess who created the Pilgrim Turkey SVG file used to create this card??? If you guessed me then you’re right 🙂 I’m going to be giving away the Pilgrim Turkey file for free (the download is at the end of this post). So, to create this I of course designed the turkey first. Boy, did it take me a while to come up with this one. I absolutely in no way think turkeys are cute so I put so much thought and time into it to make it cute 🙂 I cut it out with my favorite paper cutting machine, my Cricut Explore! I then chalked the edges of all the pieces. Each layer of the turkey comes with a mat (not sure if that’s what it’s called) to layer the the pieces on. I attached everything using an Elmer’s tape runner. I did use a piece of foam tape on the head to make it pop. I don’t know if you can tell in the picture I didn’t use foam tape on the neck, I glued it down at the edge to make it come up to the head at an angle. Since the feathers are layers, I also used some foam tape on the body of the turkey to attach it to the card. I really, really love how this Pilgrim Turkey came out, don’t you? For the card base itself I used a piece of green DCWV textured cardstock from the neutrals pack and inked the edges with a little bit of Peeled Paint Tim Holtz Distress Ink. I then used the same ink on the mat of the card (Recollections cardstock). I ran the ink pad along the edges, and scraped it over the edges. I then took a piece of a makeup sponge cut into a triangle, with a little ink on the corner of the sponge, I lightly ran it over all the ink scrape marks. I think this technique added a wonderful texture along the edges of the mat. I used one of my favorite stamp companies stamps for the sentiment. Jaded Blossom makes some wonderful stamps, made of great quality; they stamp beautifully. I own just a couple of their sets for now but some time in the future I will for sure have more 😉 The Jaded Blossom stamp I used was “Thanks for your kindness” from the Simple Sayings stamp set. In my opinion this set is a must have for all crafters. Oh yeah, the ink I used was Tim Holtz Peeled Paint Distress Ink, which worked perfectly on the stamp. Lets finish up with the embellishments I added. The sparkly orange ribbon is actually orange glitter tape by Heidi Swapp (Marquee Love). I then layered some Celebrate It Fall ribbon on top of the glitter tape. I absolutely love the vintage pumpkins on the fall ribbon, they go great with the Thanksgiving theme. I trimmed the top and bottom of the card, just along the edges of the card mat with some Green Fall Twine by Ashland. I finished up my card by adding some sequins, I think everyone loves sequins (don’t you agree); it adds just the right amount of sparkle. The sequins I used is from the Craft Medley Creative Essentials “Citrus” pack. I glued sequins on the ribbon between each pumpkin with Scotch Quick-Dry Adhesive, then added a few in the top corner of the card. So, that’s enough about my card, lets get on to the freebie. Please, please comment below and let me know what you think of my file. When you click the “Download Here” link below the picture it will take you to the download (Google Drive) once you are there, click the upside down arrow at the top of the page, then it will download. The freebie includes SVG, Digi Stamp, DXF, JPEG, PNG, and Print and Cut Files. ** Please note, each freebie download will be available for 2 weeks so make sure you get it while you can.